Low interest rates- for whom? It is indeed true that the rates on key instruments were at historical lows in the early 2000s and once again in the latter half of the decade in response to the global financial crisis. However, it is not at all clear whether the interest rates facing final borrowers in credit markets were substantially lower during the early 2000s. There are two reasons for this. First, as some have argued, (see for example this dissertation by Hasan Comert) the link between short rates and long rates has weakened significantly over the last two decades, as monetary policy began to lose some potency. Therefore, lower short rates may not have translated into equally reduced long rates. Second, given the fact that inflation rates were also at historical lows during this period, inflation adjusted interest rates may not have been very low. In ongoing work, Josh Mason and I look at actual interest payments to calculate the effective inflation adjusted interest rate on debt for households and for non-financial corporations. We find that the inflation-adjusted effective interest rates for households and non-financial corporations are nowhere near their historic lows during the early 2000s. While the rates are lower than anytime since the 1980s, interest rates were as low during the long period from 1950 to 1970 and certainly in the high inflation period of the 1970s. 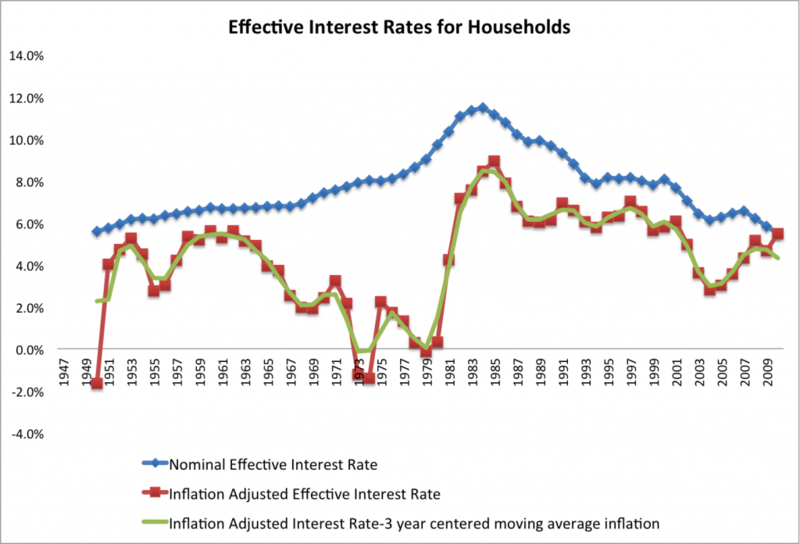 The figure below shows nominal effective interest rates for households from 1950-2010, broken up into mortgage and non-mortgage effective rates. The effective interest rate for all debt is calculated from all interest payments over a year by the household sector (from National Income and Product Accounts) divided by total outstanding consumer debt for the period (from the Flow of Funds). This is thus an average figure and not the marginal rate. The effective interest rate for mortgage debt is calculated from interest payments on owner occupied housing (from National Income and Product Accounts (NIPA)) divided by outstanding mortgage debt (from Flow of Funds data). The effective interest rate for other debt is the difference of the two interest payment series divided by the difference of the debt stocks. 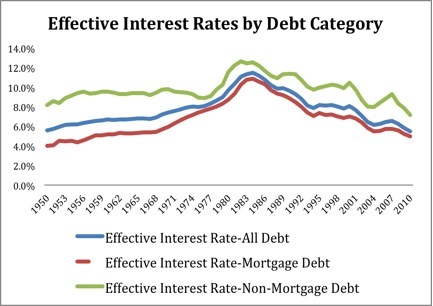 Unsurprisingly, the behavior of effective interest rates for households is basically driven by the behavior of mortgage interest rates, and mortgage rates are lower than rates on non-mortgage debt. The figure below depicts the nominal and inflation-adjusted effective interest rates. The general presumption that effective interest rates were at historical lows in the 2000s is falsified once inflation is taken into account. While there was a long downward trend in nominal rates from the 1980s on—and indeed, nominal effective rates were the lowest historically during this period up to 2003—for several long stretches before 1980, inflation-adjusted interest rates were lower than that of the lowest period post- 1980. Moreover, 2002-2004 represents the only years post- 1980 in which the average inflation-adjusted effective interest rate was lower than the average of the post war period. Given that the household sector debt of the household sector involves many different instruments with differing maturities, the third series smooths inflation using a 3-year centered moving average. However, the basic pattern does not change, with inflation- adjusted interest rates being lower in the early 2000s than anytime after 1980, (although nowhere near historical lows). This general pattern is even more dramatic when one looks at non-financial corporate effective interest rates over the period. The effective interest rate is calculated as interest payments over a year by the non-financial sector (NFC) divided by total outstanding NFC debt for the period. Effective nominal interest rates decline from a peak around 1980, but never fall to the level experienced before 1980. As a result, inflation-adjusted effective interest rates are higher throughout the post-1980 period than any period before. Even in the relatively low nominal interest rate period of 2002-2004, effective inflation adjusted rates were higher than anytime between 1950 and 1980. While striking, there may be several reasons as to the reasons why inflation-adjusted interest rates for NFCs failed to fall in line with short -term headline rates. For example, one contention is that with greater financial deepening and innovation, less credit- worthy borrowers might have come to constitute a larger fraction of borrowers, thereby driving up interest rates. Another set of hypotheses has to do with the nature of financial intermediation, and its declining efficiency. In future posts, I will discuss which of these we find to be the most plausible hypotheses. For now, it is sufficient to say that despite the received wisdom that the 2000s were a period of historically low interest rates, an examination of final borrowers over the last six decades tells a very different story. Very interesting work, as usual. There are two questions I have, however, regarding the data. 1) Do the above graphs account for the different inflation calculations used over time? 2) Are you considering the effect of tax rate changes in regard to interest rates? I’d mostly be interested in the latter question since I could imagine the after-tax interest costs showing a different pattern. After looking at some related data, it appears the real change in household debt actually fits well with your findings on effective interest rates (http://bubblesandbusts.blogspot.com/2012/08/low-incomes-not-low-interest-rates-were.html). A big difference between the 1950-1970’s period and the past couple decades appears to be much weaker income growth supporting the rise in debt and the accumulation over time. Thanks for your comment, and for the link to the very interesting article. With respect to the questions, I am not sure I understand exactly what you mean in 1), but I use only one series (the GDP deflator) to calculate inflation. With respect to 2) no, I am not considering the effect of tax rate changes in these series–these are simply net flows divided by outstanding debt as available from the flow of funds and national income and product accounts. Thanks for the reply and sorry for not being clear with my questions. The first question was based on the notion that the way CPI has been calculated has changed over time. Has the GDP deflator been similarly updated over time to reflect past changes in composition? As for the second question, I was more curious if tax deductions/credits based on interest payments would alter the graph in any meaningful way? A third question dawned on me after writing the previous post. 3) Given comparatively weak income growth and high debt-to-income ratios, why weren’t effective interest rates higher in the past 20 years than during the 1950-1970 period? Lastly, I’ve actually read that other paper by you and Josh previously and found it very helpful in better understanding the recent crisis. As a student, I really appreciate the work you both are doing and hope to focus my future research on related topics. Using average interest rates on outstanding debt could be tricky as a guide to current credit conditions. At best, it is a lagging indicator. A more appropriate indicator would be the interest rates on new loans. Question: How does the high level of refinancing of mortgage debt before the financial crisis fit into this story that households did not benefit from low interest rates? Thanks for your kind words. I really do not know the answer to both questions so I will have to think about them (and do a little background research). yes, of course, you are right that we are interested in the marginal and we are calculating the average. We do not have the term structure of all loans so its impossible to get the former as a whole for households easily. Second,there is no question that mortgage interest rates and interest rates in the early 2000s were at their lowest since the 1980s, and in that sense it was a good time to borrow (hence the high level of refinancing). What is interesting is that if you take a longer view, there was a long period of a very healthy economy with low real interest rates (1950-1970) that people tend to forget about. That was the basic point. « Can clean energy campaigns stop climate change?